The Diocese of Metuchen Office of Respect for Life had a Mass and Awards Luncheon on May 1, 2012 at the St. John Neumann Pastoral Center. This year's Theme was: "I came so that all might have life, and have it to the full." (John 10:10) Students were asked to pick someone special in their life and to draw a picture which shows what they could do to be like Jesus and help that person to live life to the full. 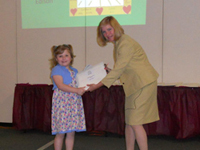 The Assumption Parish parishioner and the student of the parish school, the 1st grade student Laura Grausam was awarded 2nd place in the 2012 Respect for Life poster contest for elementary school children. She was honored at the Banquet and presented with a 2013 Pro-Life Student Calendar featuring her poster. Congratulations to Laura and to the other ACS class winners who had their posters entered in the annual contest: Aleks-Gr.2, Daisy-Gr.3, Justin-Gr.4, Elena-Gr. 5, Jennifer-Gr.6, Thomas-Gr. 7, and Brianna-Gr. 8. The contest was judged by the Diocesan Commission for Pro-Life Action.